What is the Most Important Factor When Borrowers Select a Mortgage? There are many reasons to select a mortgage lender — an existing relationship, excellent custom service, positive recommendation — but one factor stands out to borrowers by an almost three-to-one margin according to the FREEandCLEAR Mortgage Survey. 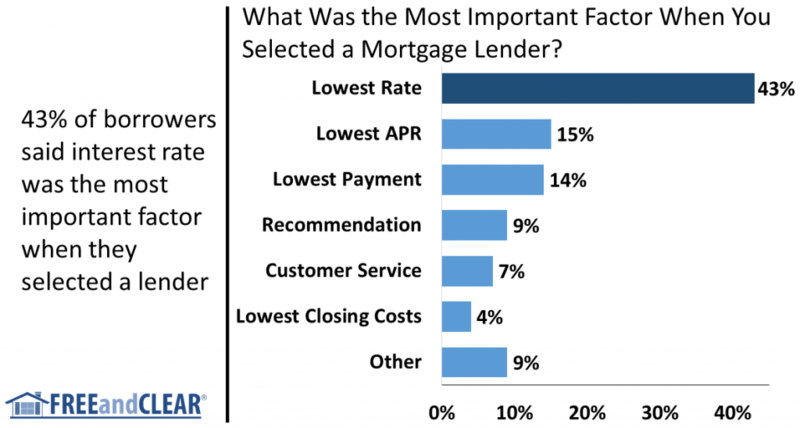 When asked “What was the most important factor when you selected a mortgage lender?”, 43% of borrowers selected “lowest rate”, which topped the next highest response by almost 30%. The results of the survey demonstrate that borrowers are keenly focused on finding the lender that offers the lowest interest rate when they shop for a mortgage. While it is not surprising that borrowers focus on mortgage rate when selecting a lender, the margin by which “lowest rate” topped our survey does illuminate some interesting issues about the mortgage process. It is telling that “APR” was the (distant) second-ranked selection, attracting only 15% of borrower responses. APR is similar to interest rate but also incorporates certain closing cost inputs. Because it reflects both interest rate and closing costs, APR is intended to represent the “true cost” of a mortgage. According to government regulations, lenders are required to disclose the APR when they provide borrowers with a mortgage quote and the APR is supposed to enable borrowers to more easily compare mortgage proposals across multiple lenders. Unfortunately, the feedback we hear from many borrowers is that APR is too complicated to calculate and understand so it comes as no surprise that they focus on mortgage rate instead of APR when they select lenders. With 14% of responses, “Lowest Payment” barely trailed APR and was the third-ranked response in the survey. Borrowers looking to stretch their monthly budgets are often highly focused on finding the mortgage with the lowest monthly payment. Your mortgage payment is directly related to your interest rate (the number one response in our survey) but is also impacted by mortgage program and loan term. The survey findings suggest that borrowers may be interested in adjustable rate mortgages (ARMs) that offer a lower initial interest rate and monthly payment. Moving past the top three survey results, the bottom half of the survey is perhaps equally informative as the top half. Qualitative factors such as recommendation and customer service lag more quantitative decision-making criteria such as interest rate. Only 9% of borrowers selected “Recommendation” as the most important factor when they selected a mortgage lender and only 7% of borrowers chose “Customer Service.” The survey findings imply that borrowers are willing to tolerate mediocre customer service to get a lower mortgage rate. Of course a low interest rate combined with excellent customer service is the ideal option but it is interesting to understand borrower priorities. Finally, coming in at sixth place in our survey, only 4% of borrowers selected “Lowest Closing Costs” as the most important lender selection factor. This result demonstrates that borrowers may be willing to incur higher closing costs, such as paying discount points, to lower their mortgage rate and monthly payment. Additionally, lenders that offer mortgage options with a range of interest rates and closing costs are more likely to meet borrowers’ needs. As much as the mortgage process has evolved over the past decade with new regulations, technologies and lenders, the FREEandCLEAR Mortgage Survey shows that not much has really changed when borrowers select a mortgage lender. While lenders attempt to entice borrowers with greater speed and functionality and borrowers have more ways than ever to search for, compare and evaluate lenders, the mortgage selection process always comes down to one number: your mortgage rate.